Environ Skincare AVST MoisturiserEnviron’s AVST moisturiser is the core product in its anti-aging and skin protection product range. It is a step-up range that contains various levels of Vitamin A and antioxidants such as Vitamin E, Honeybush & Beta Carotene. You are advised to follow the step-up procedure in order for your skin to acclimatise to the varying levels of vitamins. Environ’s AVST Moisturisers are endorsed by the Swiss Vitamin Institute which means you will be receiving the highest quality products with the correct amount of vitamins. As with all of Environ’s products, they are not available to buy online directly to the general public. Apply morning and evening after cleansing and toning. Apply 2-3 pumps across the face down to the chest. 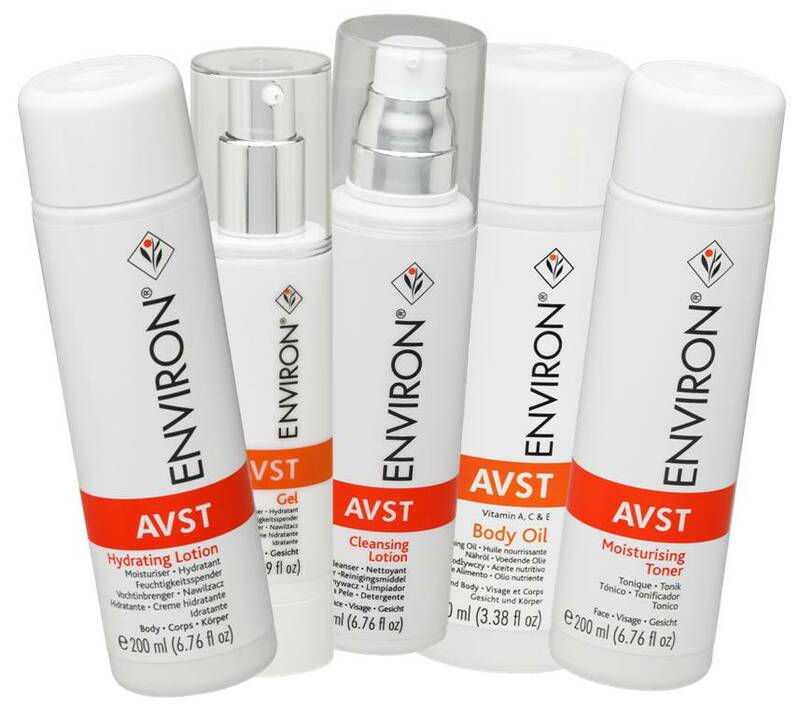 Environ AVST Body Oil, Lotions, Clensers and GelsAVST Clensing Lotion – Replacing the Cleansing Cream, Environ® AVST’s Cleansing Lotion is a highly efficient non-foaming cleanser. The Environ Cleansing Lotion comes in a 200ml bottle with ingredients such as Jojoba Seed Oil & Olive Oil Esters. It is suitable for all skin types including sensitive skin and helps to hydrate, remove excess oils and maintain the PH balance of your skin. This technically advanced formula gently and effectively removes make up, surface impurities and environmental pollutants from the skin. It conditions and assists to maintain the natural acid balance of the skin. AVST Hydrating Lotion – This easy to apply lotion helps stop the cycle of dry skin. It contains Alpha Hydroxy Acids in an easily absorbed formula which helps to deeply moisturise and soften uneven skin texture revealing a well moisturised, improved skin texture and tone. AVST Moisturising Toner - This toner contains special ingredients which work in synergy with the Environ products to assist in moisturising and hydrating the skin. Moisturising Toner also assists in improving the appearance of uneven skin tone and contains plant extracts which are known to help enhance the appearance of healthy looking skin. Containing Lactic Acid, Vitamin B5, Rosemary and Honeybush it is mildly exfoliating leaving the skin with an even tone. It helps to hydrate and protects from free radical damage. Suitable for all skin types and ages. After pre-cleansing and cleansing with your preferred Environ products, apply to the skin using cotton wool and continue with your recommended Environ vitamin A moisturiser. Use morning and / or evening. AVST Body Oil - Fine textured oil formulated to provide the skin with a high concentration of vitamins and antioxidants to help energise dry and sun-damaged skin, leaving it looking velvety soft. Assists in shielding the skin from harmful external influences. Assists in improving the appearance of fine lines, uneven skin tone and sun damaged skin resulting in a healthy nurtured appearance. Apply in a thin layer twice a day after a shower / bath; massage into the skin and follow with your preferred Environ sunscreen when exposed to the sun. AVST Gel – An introductory, moisturising gel that contains the lowest concentration of vitamin A, vitamin C and antioxidants in this range. This unique gel is also efficient in helping to calm sensitivity, redness and irritated skin, resulting in a radiant and fresh-looking skin. Environ products require a consultation before use and purchase to ensure no complications or reactions to the highly active ingredients.